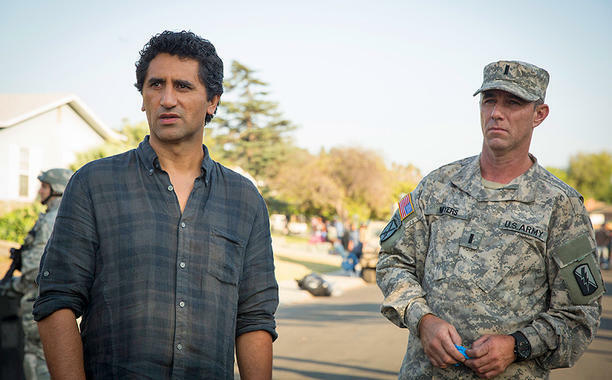 This week we have finally, finally gotten a date for the new show “Fear the Walking Dead”! Cassidy Frazee called it saying the show would start on August 23rd! Cassidy has been writing for Rachel Tsoumbakos and giving his insight to the show “Humans”. So our hats are off to Cassidy for calling this one and being absolutely correct! The weeks are counting down rather quickly and with each new preview we get to see a bit more of the big picture. We even get to see a couple of walkers munching away! I like how it shows everything falling apart and the descent into the madness that Rick and the gang have been living in for the past 6 years. It will be interesting to see who the core actors are who manage to survive season after season. I saw a brief glimpse of the principal of the school and it doesn’t look like he makes it to the second show. That, however, remains to be seen on August 23rd. I know I am looking forward to how they will spin the whole falling apart and am greatly interested to see if any people group together to help each other out for the greater good or if it is basically every man or woman for themselves. It will be interesting to see how fast the scenery changes as well around the characters. Will it take quite awhile to have things start reverting back to nature or will people struggle to continue their lives as they knew it before, basically struggle to stay in denial. I see portions of the show that almost make you want to scream at the t.v. Nick is telling the truth about what he saw in that druggie house! The kid, Tobias, is on to something teach, you better listen! We all know how much the government always tells us the truth as well. Will the kids adapt faster than the adults? Up until now we have really only had Carl to base our reactions on and how he has adapted. Will the new teens with family struggles with newly joined families be able to cope better than the parents? What questions do you have about the new show? What do you see as a big difference from the original show, “The Walking Dead.” The biggest question I have, will Chris Hardwick be doing a Fear the Talking Dead after the show? What do you think? This show is set to air in August sometime. We don’t have a concrete date yet but I wanted to give some insight to what I think the show will be like. I am a huge fan of the original show The Walking Dead and have mixed feelings about whether or not it will live up to its predecessor. The previews so far have been pretty minimal and leave a lot to the imagination. The cast of characters are shaping up to be some pretty good characters with actors such as Kim Dickens, Cliff Curtis, and Frank Dillane. The story settings are completely different from the Walking Dead in that it takes place in Los Angeles where it is as different from Atlanta, Georgia as Iowa is from Hawaii.Los Angeles has a landscape that just goes on and on with one city running into another for miles. The interesting thing I find even in my research of the cast of characters and their jobs in real life or their skill sets, none of them so far are survivalists in the apocalyptic sense. No Dooms day preppers or wilderness survivalists, just ordinary teachers, students and such. There is one military person who will have a recurring spot on the show but not even that guarantees a good set of survival skills. I like how they take the ordinary people, like you and I, who have not prepared for this type of situation and throw them in there and just wait to see if they can survive it. The people chosen to tell the story give a wide variety of opinions from “The Government would tell us the truth” to “It’s just the flu, right?” It will be interesting to see what finally happened in the days following Rick Grime’s shooting until he awoke. Finally we will get to see how things got so bad. For now, we see people who are safe in their normal everyday lives with just a hint of what might be coming just over the horizon. I sincerely hope that Fear the Walking Dead lives up to its predecessor, The Walking Dead. Maybe that is why they are holding previews to a bare minimum in case it doesn’t get received as well. Time and opinions will tell. I will be doing a weekly blog update as more previews show and a set air date arrives. I look forward to your comments and questions and I will do my best to answer them.